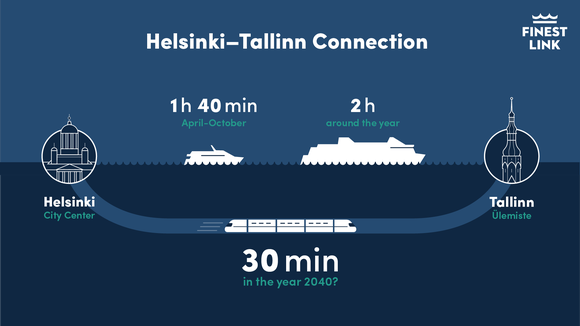 Helsinki to Tallinn Tunnel - Could This Become a Reality? A railway tunnel between Helsinki and Tallinn has been proposed as a way to connect the Finnish and Estonian capitals. However, what is the likelyhood of this becoming a reality? How would it affect ferry travel? Helsinki and Tallinn are currently linked by several ferry operators. The proposed undersea tunnel would be the longest undersea tunnel in the world. If constructed, the cost is estimated at around €16 billion with construction starting in 2025. The EU has approved €3.1 million towards a feasibility study. Freight ferry travel between Helsinki and Tallinn currently takes around 2 1/2 hours with Tallink Silja Line, Viking Line and Eckero Line. Around 3.8 million tonnes of freight travel on the route every year. It is predicted that 8 million tonnes in freight traffic using both ferries and the tunnel by 2050 would fund more than half of the project investment. The tunnel project, known as the FinEst Link project, is being partly financed by the joint Central Baltic Program, which is led by the Helsinki-Uusimaa Regional Council and the Estonian Ministry of Economic Affairs and Communications. The cities of Helsinki and Tallinn initiated a preliminary feasibility, which was completed in February 2015. The study focused on the technical and economical viablility of the tunnel. The full feasibility report, which was completed in February expects the tunnel to be around 92 kilometres long (the Channel Tunnel is 51 kilometres) with two artificial islands and two rail tunnels (and a service tunnel) using the standard European 1435 mm gauge. The tunnel would be located 215 metres below sea level at its deepest point. The full report is available to download from the FinEst Link website - FinEst Link Feasibility Study – Final report. "From the viewpoint of deeper twin-city integration and regional development there could be major benefits from the tunnel. Geographically Finland resembles an island and the tunnel would offer a connection to the Central European rail network." Daily capacity is expected to consist of 40 passenger trains, 11 car trains, 17 lorry transporter and 3 freight trains with a journey time of around 30 minutes and an estimated ticket cost of €18 each way.